Purpose of Exhibit: To illustrate the establishment and development of the civilian British Postal Service in the Ottoman Empire from 1857 (when the first British PO was opened in Constantinople after the end of the Crimean War) until 1923 (when all foreign post offices were abolished in the new Republic of Turkey). Historical Background: Great Britain was among the Powers that operated their own Post Offices on sovereign Turkish territory in the 19th century. This anomaly of national post offices operating in the Ottoman Empire was due to the so-called Capitulations. The term "Levant" is used to describe the Ottoman Ports. Postal Background: A civilian British Post Office was first established in Constantinople in 1857, a year after the closure of the Army Post Office which was set up during the Crimean War. In the following years, four more offices were opened in the Levant: Smyrna in 1872 (now Izmir in Turkey), Beyrout in 1873, Stamboul in 1885 – a Constantinople sub-office and Salonica in 1900 (now Thessaloniki in Greece). The Balkan Wars of 1912-13 and especially the outbreak of WW1 severely affected the Levant postal network, causing the indefinite closure oi the Offices by the Sublime Porte in September 1914. It was only in 1919 that the British re-established civilian POS in Smyrna and Constantinople. The former was burned down during the destruction of Smyrna in September 1922, white the latter closed permanently in September 1923. The exhibit is organized by Post Office and divided in two periods: Part I: 1957-1914 (The pre-war post offices, the effect of war on British Levant mail), Part II: 1919-1923 (The post-war post offices). Original research: The exhibit reflects considerable original research in the PO Archives in Mount Pleasant, London and new discoveries are regularly reported in "The Overprinter" Journal of the Great Britain Overprints Society of which the exhibitor is the Levant Research Coordinator. 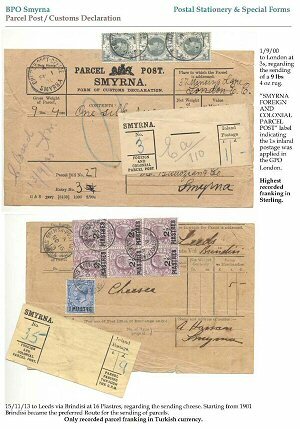 A brief synopsis on British Levant postal history was also published in Gibbons Stamp Monthly (June 2010, pp 55-58).